Brown ground beef in a large skillet over medium high heat. Add garlic, ginger and stir fry for 2 minutes. Add 1/2 green onions (white part) and stir fry for 1 minute. Add brown sugar, soy sauce, sesame oil, crushed red pepper and bring to a boil. Reduce heat to medium low and simmer for 5 minutes. In a large skillet over medium high heat add 2 TBS oil and scramble eggs. Remove eggs, add remaining oil along with garlic and stir fry for 30 seconds. Add cauliflower, peas, carrots and stir fry for 2 minutes. 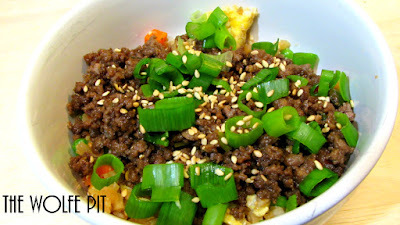 Add green onions and stir fry for 30 seconds. Add soy sauce, sesame oil, sugar, salt and stir fry another 2-3 minutes or until to your desired tenderness. 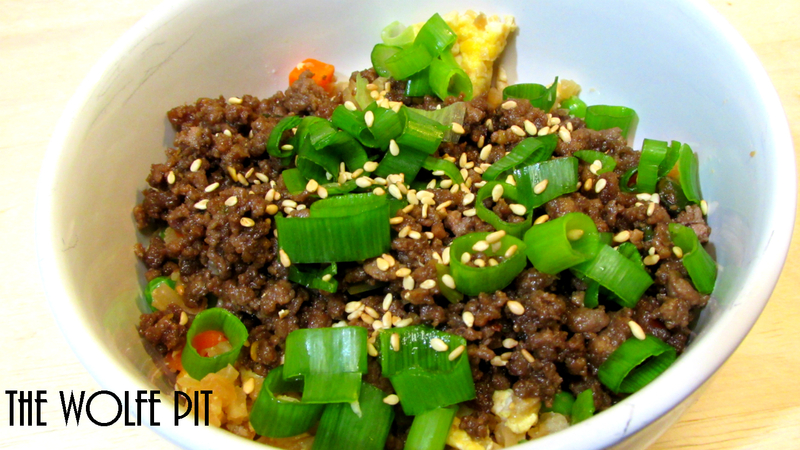 Serve the meat mixture over the fried rice and sprinkle with green onion and sesame seeds. OR serve in lettuce wraps.